perhapablog... and other ramblings: thanks to warren and mike! the day after the day after christmas~! thanks to warren and mike! the answers to roger's trivia! j'ever have one of those weeks...? if you haven't seen this, you should. the other day, warren sent me this awesome link knowing how much i appreciate seeing nature in action. i say awesome; i think his words were unbelievable and mind-blowing. i agree. here's the article he sent me and you should check it out. incredible! 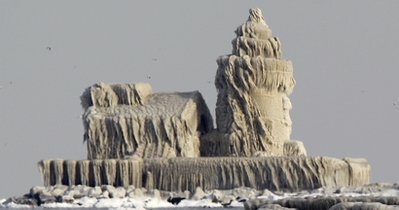 This image provided by the U.S. Coast Guard shows waves from Lake Erie crash onto Cleveland Harbor West Pierhead Lighthouse Tuesday Dec. 14, 2010 as the subzero air temperature causes the water to freeze in multiple layers, coating the entire structure in ice and making it virtually impossible for mariners to see the light. also on the i-got-so-caught-up-in-things-i-haven't-had-a-chance-to-mention-it list, a month or so ago i found a neat treat in my mailbox; a copy of the the most recent issue of the celebrated weird nj from our pal and proud weird nj resident, mike estelle! i have expounded here on the blog on the cryptic and creepy series of books that the infamous weird nj guys had published in conjunction with barnes and noble (weird my, weird ny, weird new england, etc. ), but hadn't looked at a copy of the magazine in years. 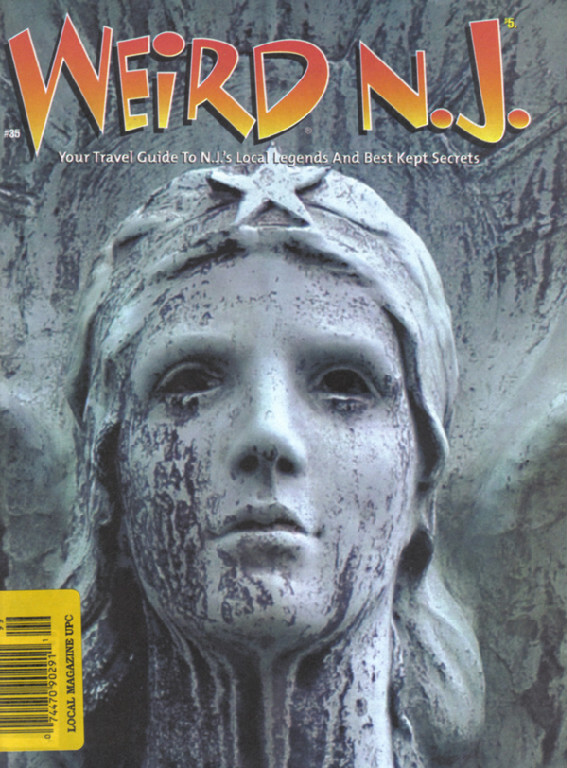 published twice yearly, weird nj is just the thing for those of us fascinated by the paranormal, drawn to relics of the past like abandoned factories and asylums, cemeteries and rural areas surrounded by urban legend or just the weird things you might just run into in your travels around the garden state. or anywhere. like, i mean, what the hell is this? (apparently, it is a statue used in the 1954 lana turner film, the prodigal. it was purchased by a resident of lumberton, nj who got a permit for it and put it up on his property along rte. 541 where it looms large over the neighborhood. of course, there are elements in the township that beg for it's removal calling in an eyesore. if you're ever in barnes and noble and you see a copy of weird nj, pick it up and give it a look. or better yet, check out the weird book they did on your state--it's curious stuff! how's your christmas coming together? While I think that's a very cool statue, I gotta side with the neighbors. Yeesh. I want that statue in my front yard with flaming shooting out of its eye and a menacing laughter 24/7. Also it should have waterslide. i had seen that lighthouse article the other day. that was some cool stuff!! and yeah all the weird (insert state here) books are really cool. karen's a huge fan of all that stuff and we'll go out every now and then to go check things out in person. have yet to check out that statue-but i like christian's idea of what to do with it! Yeah, that shot of the lighthouse was amazing. As for the statue, I'm with Matt. Christmas wise, I've got a couple of gifts left to wrap and then I am home free. We are getting a little snow in my neck of the woods right now so, it's beginning to look a lot like Christmas . 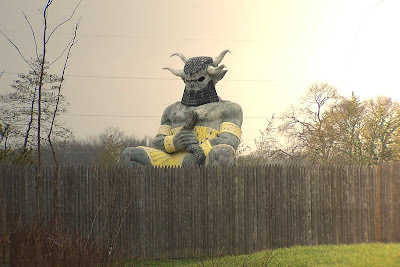 . .
Oh man -- before it moved to NJ, that funky statue used to sit outside a travel agency back in my home state of Delaware. It was there for at least 15 years, and I don't remember anyone complaining about it. Cool to see it again!